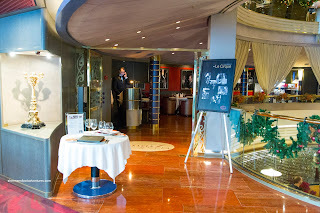 Our past 2 cruises on Holland America involved the kiddies, so it wasn’t that practical to try the Night at Le Cirque dinner at the Pinnacle Grill. One night each cruise, the Pinnacle Grill becomes Le Cirque (of New York) featuring some of their most popular menu items. For $49.00 extra, it didn’t seem economically sound to bring the kiddies along (especially since my son wouldn't eat half of the stuff). So since our 3rd time on HAL didn’t involve anyone else, Viv and I finally decided to see if it was worth the price tag. 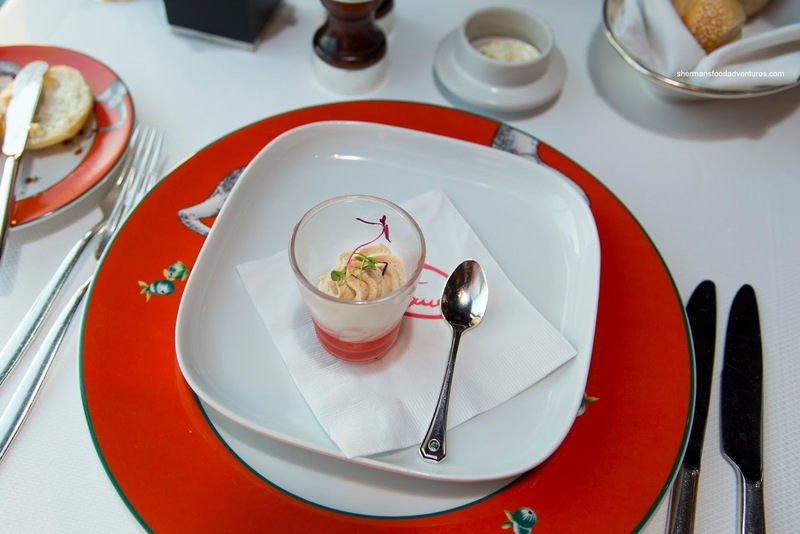 We were started off with an Amuse Bouche consisting of Foie Gras Mousse with rhubarb chutney and Madeira wine. Since they had refrigerated the amuse prior to serving, the foie gras mousse had hardened where it came out as one piece with the initial spoonful. This would’ve been better if the mousse was piped to order. With that being said, the mousse was creamy and tasty while nicely accented by the sweet and tart chutney. 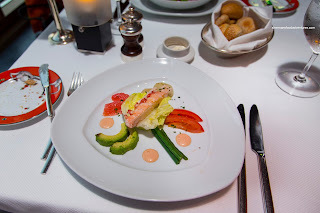 For our appies, Viv had the Lobster Salad “Le Cirque” featuring butter lettuce, green beans, potato, tomato and grapefruit segments. 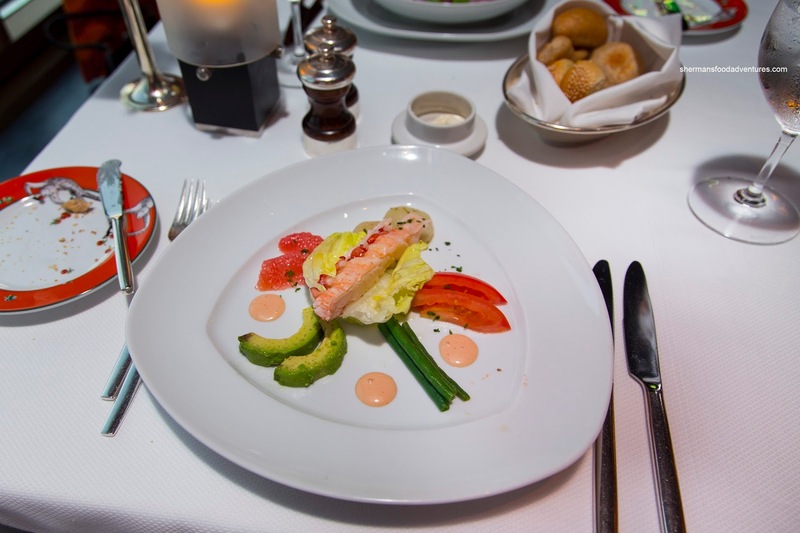 This was a deconstructed creation where the lobster was buttery and sported a nice sweet rebound. The veggies were all the right textures and the potato was especially good being flavorful and appealingly tender. We felt the grapefruit was too acidic for the salad though. I went for the Yellowtail Snapper Crudo atop broad bean puree and diced watermelon with huckleberry sauce and pea mojito. For me, I thought this didn’t work. Nothing wrong with the execution as it was practically perfect. However, the flavours were dull and didn’t compliment the fresh buttery snapper. 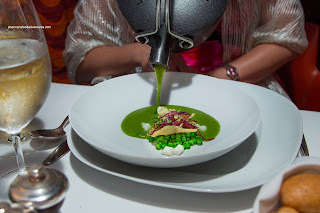 We also went for both soups with Viv having the Garden Pea with plump peas cheese dumplings and idiazabal crisp. The hot soup was served table side and this was key because the temperature allowed the sweetness to come through. 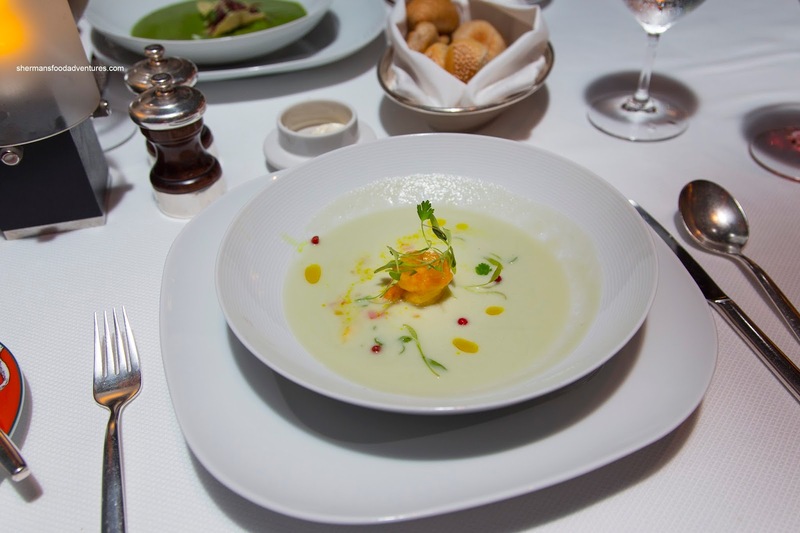 A cold soup, like the ones we had in the main dining room, resulted in dull flavors. 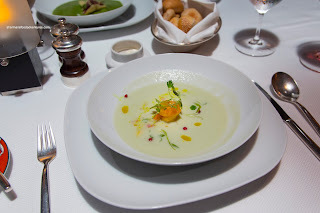 This soup was smooth, almost creamy and bright. The plump peas were nicely bursts of sweetness with every spoonful. Although I don’t usually like cold soups, the Chilled Yogurt and Melon with shrimp was refreshing and varied in flavour. It was sweet and bright with also the right temperature. The addition of cilantro added another layer of flavour. The best dish by far was the Chateaubriand with horseradish flan and sweet & sour beets. It was carved table side where it revealed a perfect (and really, it was perfect) medium-rare steak that was properly-rested. 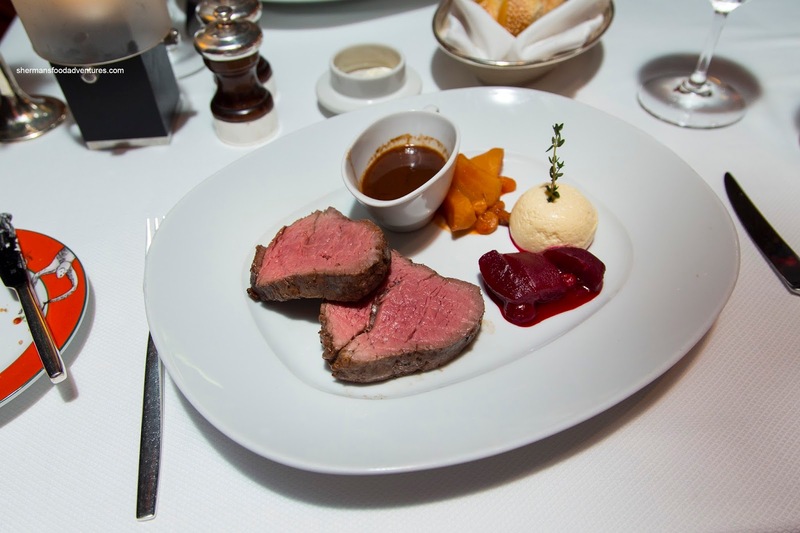 Hence, the meat was super soft and tender and ate consistently from start to end without any loss of moisture. The jus on the side was meaty and flavorful while the horseradish flan was creamy and only lightly sharp. Viv had the Sea Bass with wakame salad, peaches, capers, bourbon vanilla and chicken oysters. 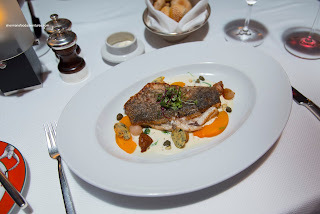 Sporting crispy and well-seasoned skin, the sea bass was flaky and moist. The ingredients were all complimentary except the peaches as it was a bit weird being sweet and fruity with the fish. 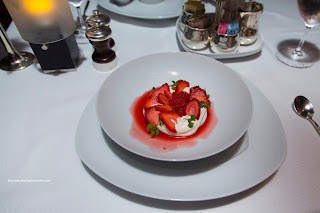 For dessert, I had the Strawberry Pavola which was fantastic. 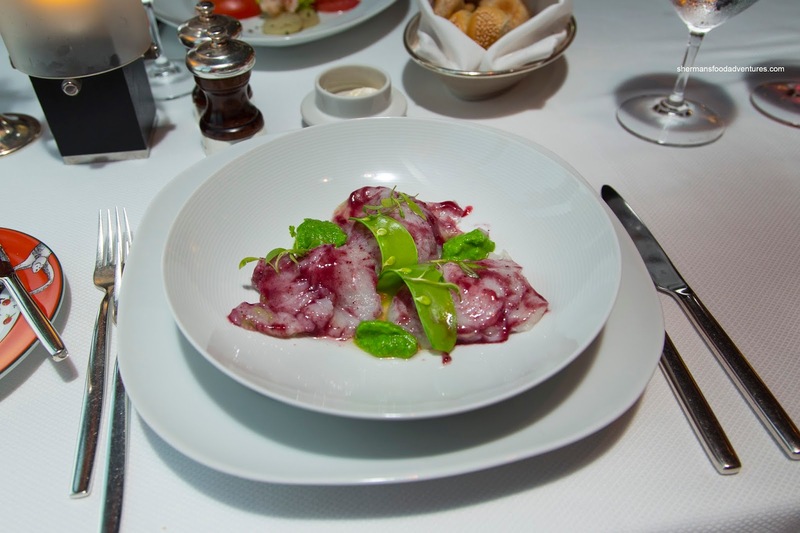 Usually, this dish can be rather boring and meringue-focused. This one only had a small ring of airy meringue topped with earl grey Chantilly, fresh sliced strawberries, dehydrated strawberries, strawberry sorbet and strawberry consommé (served table side). It was well-balanced, not too sweet and completely strawberry-tasting in 4 ways. 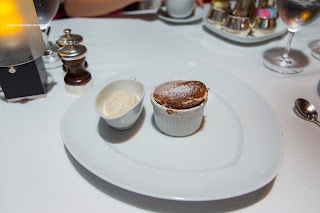 Viv had the Chocolate Souffle with vanilla ice cream which was also quite good. It hadn’t fully collapsed so it was airy and light. The dark chocolate was not very sweet and appealingly bitter. At the end of the meal, we were fairly satisfied, but at the same time, weren't blown-away. However, considering that $49.00 wasn't incredibly expensive, it is an experience worth trying.